Welcome to the hub for the Enterprise Transformation at Georgia Tech. The Enterprise Transformation is a portfolio of initiatives managed by the Enterprise Resource Planning (ERP) department. Stay up-to-date with program activities and progress. Are you ready for Workday? 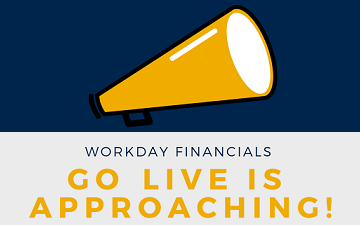 The Org Readiness Team invites you to participate in the Workday Go Live survey to help the team assess campus readiness for Go Live. This brief survey will close on Friday, April 26th. We appreciate your participation! Learn about how Georgia Tech is aligning our HR processes with the University System of Georgia. Subscribe to the Financials Transformation bi-monthly newsletter. Reporting in Workday will enable campus to make informed business decisions. With real-time data and drill down functionality, Workday reporting works with users to proactively identify anomalies and trends. In preparation for go live, program leadership held the first of four go/no-go discussions earlier this week. In these discussions, we evaluate status, assess risks, and develop effective strategies to alleviate obstacles in our path. The goal of these sessions is to use metrics to review evaluation criteria and make determination our readiness for go live.